Bouquets in white or pastel colors symbolize clearness, tenderness and care. It is always the best gift to mom for Mother’s Day, grandmother for anniversary, girlfriend for birthday or wife for St. Valentine’s Day. 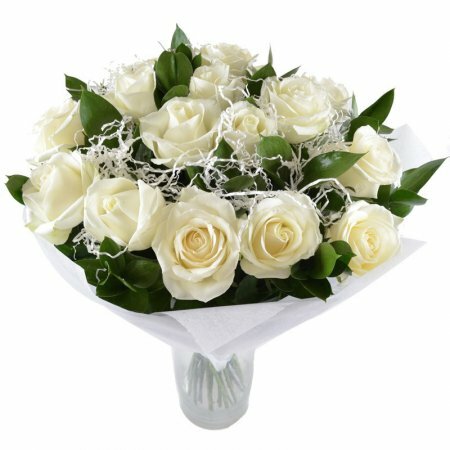 Light ocean of white exquisite roses in your best way to show deep emotions and gratitude to the one you love. Turn every bad day into the holiday with such congratulation or even surprise. The delivery of such white roses bouquet looks like the episode from the most favorite women’s films, so make your loved person the main character of your own romantic film. Just order the delivery and your lady will be the happiest in the world! Note: the bouquet can differ from the image on the website. The price of the vase is not included.